“It was so much fun to play in those games, in those series. It was probably the most fun time of my whole career. But Domi, whose success in hockey was built on hard work, confidence and a fierce competitive spirit, said those Leafs teams knew they could beat Ottawa. Domi, too, played a role, especially one time when he really used his head. “You guys were beating us 2-0. We had nothing going on at all. You know how sharp the boards are, right? I kind of saw him (Ottawa defenceman Ricard Persson) coming. He didn’t hit me that hard but when he did hit me I purposely hit my head (on the boards) just above my eyebrow. That cut came on May 12, 2002 and it was a turning point in a crucial game. Recently the Citizen called that 4-3 loss the worst ever suffered by the Ottawa Senators. At the end of the day it is about winning, Domi says, and doing whatever it takes. 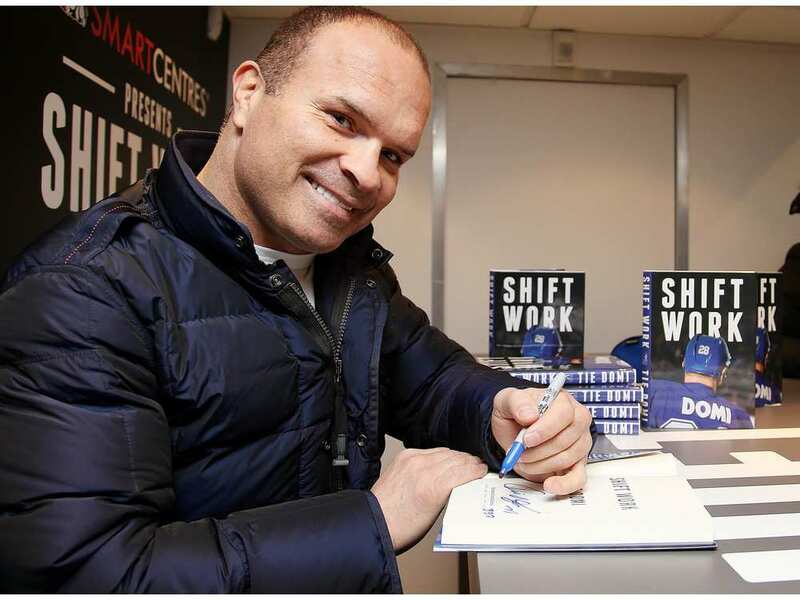 Toronto Maple Leafs legend Tie Domi signs his book Shift Work for fans while on a book tour. 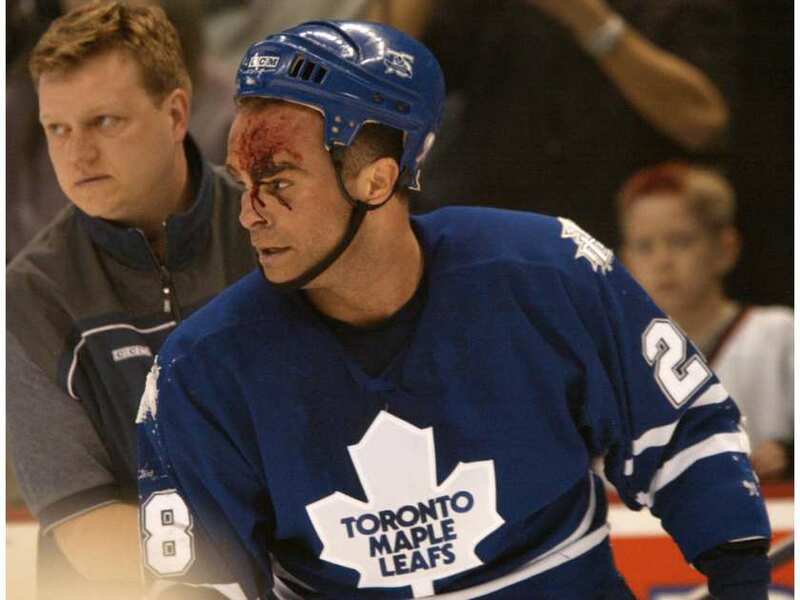 But his book is not about all the fights (333 in the NHL) or about the lingering effects of 17 years in the NHL. In fact he won’t talk about any of that. “I never wanted to write a book about why I had the most fights. I had the most fights because it was part of my job and I was protecting my teammates, and I didn’t really want to talk about it. I wanted to do the book my way and have a positive impact about it. The playoffs were Domi’s time. And he reveres the two coaches, now gone, who helped him get to that level. Pat Burns and Pat Quinn were the best coaches for whom he played. Burns, in particular, told him to practise hard and he’d be rewarded. Domi is now watching his son, Max, who has overcome his own obstacles to make the NHL as a first-round pick of the Arizona Coyotes, not least of which is diabetes. Domi isn’t worried about his son in the NHL. But he was concerned when Max was playing in the Ontario Hockey League with the London Knights. “There is no protection there whatsoever. That league has a long way to go in protecting its best players. And he worries about the lack of respect players show for their opponents. “I just don’t know if that respect is there. When Bob Probert, Joe Kocur and I were doing the job, we policed the game the best we could. It’s a different time. “I think (Ottawa Senators) Chris Neil is the only guy left who plays the way I did. When this son of immigrant parents was growing up, sport was his medicine. Domi has dyslexia and had an attention deficit disorder, making education difficult, so he used sport as his way forward. Instead he joined the Peterborough Petes and made his way to the NHL. 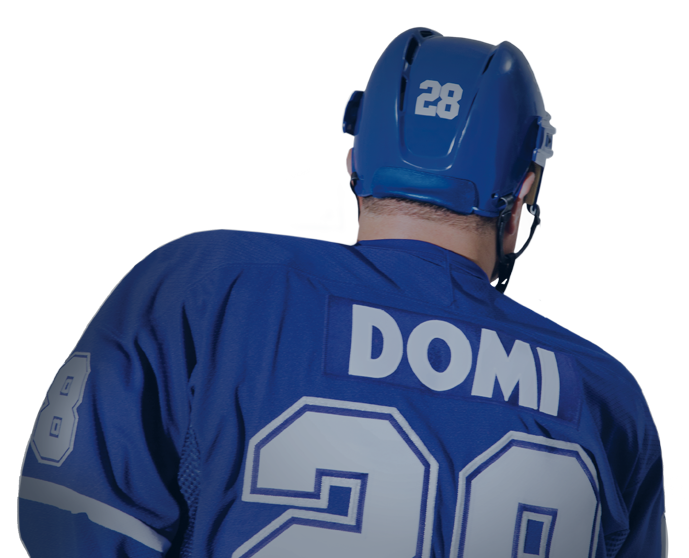 Because of his dyslexia, Domi dictated his memoir. The interviews and information were gathered by sports journalist Jim Lang. It was a painstaking three-year project. “I went through every single line. I wanted my voice said my way. These days Domi isn’t looking back. He is still playing sports.